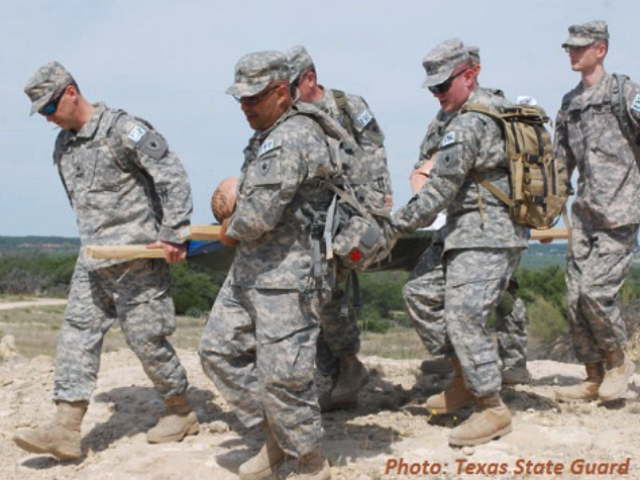 A Honduran woman was rescued from an almost certain death by members of the Texas State Guard. The guardsmen were on a special mission to assist the Brooks County Sheriff’s Office in Falfurrias, Texas to help find the bodies of illegal immigrants who have died crossing the ranch fields in an attempt to bypass the U.S. Border Patrol Checkpoint located south of the town. During the operation the guardsmen encountered two illegal immigrants who advised them of a woman who was left behind and was near death. Members of the Texas State Guard immediately began a search operation to find the woman. When she was eventually found, she was barely alive. The woman was identified as a Honduran national. She was given life-saving treatment from the guardsmen and was then transferred by a Texas Department of Public Safety (DPS) helicopter for further treatment. Had the guardsmen not been on this mission, the woman would have joined the fifty-plus others who have died in the ranchlands of Brooks County. A total of five illegal immigrants discovered by the team were taken into custody by agents of the U.S. Border Patrol. Well over 300 bodies have been found in these ranches since 2011. After intense media attention on Brooks County over this summer including several articles by Breitbart Texas, Governor Rick Perry ordered the deployment of specially trained search teams of the Texas State Guard to assist Brooks County sheriff’s deputies in trying to find all of those who have been lost this year as well as attempting to prevent further deaths. The Brooks County Sheriff’s Office may now continue to request deployment of these guardsmen for short term search and rescue operations. According to a statement from Gov. Perry’s office obtained by Breitbart Texas, these specially-trained teams of approximately 20 to 25 personnel will search for human remains in the area. The Texas State Guardsmen conducting the searches are trained in search and rescue/recovery operations, and will utilize a variety of resources, including all-terrain vehicles, cadaver dogs, grid searches and medical support personnel. Security support during these searches will be provided by DPS Troopers or U.S. Border Patrol agents, who will also provide specialized resources for these recovery missions. The Texas Rangers may also provide investigative support for these cases when requested. The Texas DPS is also currently still engaged in Operation Strong Safety, a combined deployment of DPS Troopers and members of the Texas National Guard. The DPS has moved some of these resources to the key highways of Brooks County which are funnel type pipelines for both drug trafficking and human smuggling. The checkpoint has also given rise to human trafficking crimes in Brooks County as reported by Breitbart Texas. The Texas State Guard is separate and distinct from the Texas National Guard. It is one of three branches of the Texas Military Forces which are under the command of Air Force Major General John Nichols. The State Guard is made up of civilian, non-paid volunteers who serve the state during times of emergencies such as hurricanes and flooding. More information about the State Guard can be found on their website.